When an emergency happens, you need care fast, but did you know you don’t always have to go to the ER to be treated? Non-life-threatening illnesses and injuries can be treated at an urgent care like FastMed in Hickory, NC. FastMed provides a quicker and more convenient option than the ER, without sacrificing quality. Our fast, low-cost emergency care is right at your doorstep. 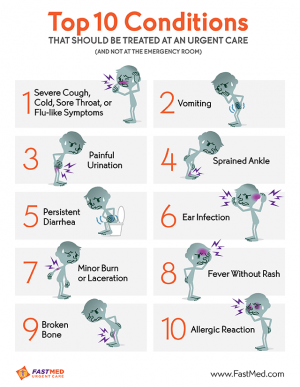 I Need Emergency Care, Should I Visit FastMed or the ER? When an injury or illness occurs, you should quickly decide how serious it is and seek medical attention. You have the option to call your doctor, visit the ER, or visit an urgent care, but sometimes it is difficult to know which option is best. For more information on when to visit the emergency room and not urgent care visit MedlinePlus.com. FastMed Urgent Care provides emergency care on a walk-in basis, with no appointments needed. We accept most major insurance carriers, all major credit cards, and personal checks for in-clinic payment. Our Hickory, NC, location is open from 8am-8pm on the weekdays, and 8am-4pm on the weekends.